I thought it could be quite versatile and was inspired by the Design Team samples this week. Here is my card using Tea for Two Dsp, Floral Frames Framelits, Little Leaves Sizzlits and Madison Avenue SAB stamp set. My children just pointed out that "Polly Put" looks rather strange at the top of this sheet of dsp. Pity I don't have a friend named Polly I can give this to. I've used the smallest 3 of the floral frames for my blossom, with the smallest stamped and the other 2 cut from Primrose Pink Core-dinations Cardstock and embossed with the Lacy Brocade Embossing Folder. The greeting comes from the set Itty Bitty Banners. Thanks so much for stopping by. I hope you've enjoyed the visit. Please leave me a comment, if you like what you see and I'll be back again soon with another card. Below is my Design Team card for the current sketch this week at the Paper Craft Crew. I've used a number of Sale-a-bration products on my card this week, namely the Bloomin' Marvelous Stamp Set, Vine Street Embossing Folder on my background and some of the Sycamore Street Ribbon. My base card is Very Vanilla with my Postage Stamp squares punched from Wisteria Wonder. Ink Colours are Rose Red, Wisteria Wonder, Lucky Limeade and Pink Pirouette. Here is the current sketch, which I hope you will join along with. I'll see you over at the Paper Craft Crew. Why don't you head on over and check out the other Design Team members creations. This week at Just Add Ink they have a pop up card challenge. Well, I like a challenge and haven't made a Pop-Up card in ages since I made this cute tissue box card here after a demo friend sent me a swap. Thanks so much for this challenge, as it gave me the incentive I needed to make another. I've had these Present pop-ups on my "To Do list" for a long time, so it was about time I made it. I thought our Sycamore Street Sale-a-bration papers worked well together for this Birthday card, plus there are a couple of new products included from our Seasonal Catalolgue making an appearance here, namely the Delicate Designs Lace Tape and the Needlepoint Borders embossing folder. My Birthday greeting is from the set Perfectly Penned. This is the front of the card here, but the main surprise is when you open up the card and look inside. Check out the inside. It was such fun to make. a couple of brights with a Neutral. I've used the Rain or Shine Stamp set combined with Ovals Framelits, Cloudy Days Embossing Folder, Itty Bitties stamp set and Designer Builder Brads. This is a closer look at the front panel of my Oval Easel card. This is a closer look at the base of it which shows the cute little duck image in the centre of the brad. And here is a side on view on my Easel card. Thanks so much for stopping by. I hope you've enjoyed viewing something a little different. Please leave a comment and let me know what you think. I have previously showed you Anna's Birthday card as her birthday was actually Monday 18th Feb, but today was the party. I have a few extra Stampin Up things that I made to add to the day. I had to make a lot of these beforehand as I didn't know how up to the party I would feel after surgery, and I've left my husband in charge of most of the setting up and decorating with the girls. Here are a few bite sized party cakes which I made little Cake Toppers for using the Sale-a-bration set Pretty Petites and the Petite curly label punch. The first photo I took was inside (better lighting) and the second to show you how they matched in with the party theme on the outdoor table. The next photos are of the Party Bags I made all the girls using our Petite Purse die. They each contained a Mini packet of Mentos, a Freddo Frog and a Caramel. Here is the icecream cake Grandma made for the party. Just a quick post here. I haven't felt like doing much these last few days (following surgery), but managed to have a play with my new set Rain or Shine. Here is the first card I've made. This stamp is available in our Seasonal Catalogue. Thanks so much for stopping by, see you soon. We have experiencing the most shocking run of wet weather once again here on the Sunshine Coast, Qld with more flooding. My husband measured more than 12 inches of rain over just a couple of days. How much more than 12 inches, we are unsure because the rain gauge was overflowing when he checked it. A bit of a reprieve today with a little sunshine. Anyway, its been great weather to stay indoors and do some papercrafting. I made my card early, because I've had a few days off due to surgery. Here is my Design Team card for this weeks Paper Craft Crew Sketch. I've used the Owl Builder Punch on the focal point of my card this week and my background is a layer of Designer Series Paper from Beyond the Garden (retired from my stash), Cloudy Days Embossing folder on my black piece and En Francais Background stamp on my green layer. I've also used the Little Leaves die and I've used Square Lattice Embossing folder on my Owl and Wisteria Panel. I wanted to share with you today the Birthday Card that I've made for my youngest Daughter Anna. She turned 12 today at 5.28am. She loves the colour blue and is quite partial to owls so our SU Owl Builder punch has come in handy once again. I've made this Twisted Easel card for her. I've also used the Cloudy Days and Square Lattice Embossing Folders on this card and teamed them with Little Leaves die and stamp sets Memorable Moments and Perfect Punches. My Cardstock is Midnight Muse, Marina Mist, Pool Party, Whisper White and Pear Pizzazz, with just a touch of Basic Black for the eyes. You may notice some of the new Delicate Details Lace tape along the base of the card. I added some extra little hearts from the Owl Builder punch to them. I've been having a little play with the Owl builder punch lately and here is the first card I've made. Cardstock colours are Wisteria Wonder, Marina Mist, Basic Black, Pear Pizzazz and Whisper White. I've used the little blossoms stamp from Betsy's Blossoms and greeting from the retired Well Scripted set on this Twisted Easel Card. Thanks for looking, I'll be back with another one tomorrow. This week it's a colour challenge at The Paper Players. They were rather a bright combination for me, however, I'm happy with what I've created. Well, I wasn't quite finished in time to enter, but here is my card. It's called a Joy Fold Card. I've used some Patio Party Dsp with the cardstock colours of the challenge, Midnight Muse, Primrose Pink and Summer Starfruit. I've used the Labels framelit to create a mini card, which opens opposite to the main card and I decorated the front of it with a layered butterfly using Beautiful Butterflies die and Beautiful Wings embosslits finished with a Designer Build a Brad. The oval with the Pretty Petites "For You" is what holds the card closed, the label framelit just slips under it. I hope you've enjoyed seeing my card, even though I'm not eligible to enter the challenge. Wanted to wish you all a Happy Valentine's Day, wherever you are. While I'm not that much into Valentine's myself, my husband did surprise me with an early gift which he had ordered online. Just to keep you in suspense, firstly here is a card we made at my last class, which suits the Valentine theme. I put a simple Love You sentiment on it. If you would like to order any of the products used to make this card, please contact me. Now, does this photo below give you a clue as to what my gift was?? Well it's actually a gift that can be used by the whole family. I am willing to share and let others try it too! Ta Da...................it's a new Coffee Machine. We had actually been thinking of buying one for a while now, and my husband did the research and decided on this one. It's fantastic, I'm actually thinking we'll be getting more visitors now to try it. These colours remind me of Flowers and Spring, but aren't a colour combo I would use often. This is what I've created using the sets Oh Hello and Papillon Potpourri. I wanted to do something a little different, an Accetate Card. Yes it's been a while. These were a class favourite a few years back. I've cut my accetate base with the Square Scallop die and stamped with stazon white ink on the front with the Oval pattern stamp from Oh Hello and stamped a butterfly into the corner of the front with Papillon Potpourri. I've lined the inner back of the card with Calypso Coral card and stuck the greeting onto the inside. It's time again for another challenge at The Paper Craft Crew. This week we have a sketch and a theme of Valentines. I hope my card below will inspire your to enter one of your own. Sketch Challenges are awesome fun, and contrary to what some think (my friend Vicki) they are easy! And, here is my card using some pieces from the Artisan Embellishment kit, Full Heart Punch, Top Notes Die and Honeycomb Embossing Folder. The cardstock is Very Vanilla, Crumb Cake and Primrose Pink with a little of the More Amore Specialty Designer Series papers. I've also used the new Occasions Paper piercing pack to add some detail around the hearts. Thanks so much for stopping by. 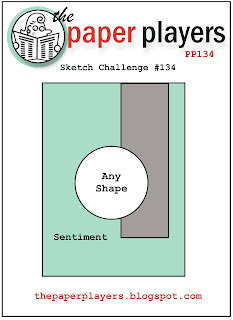 I hope you will be inspired to play with the sketch and join in this weeks challenge at the Paper Craft Crew.